Nice deal. Do you know how long it goes for? They ask me to post these deals usually but someone else beat me to it this time. It’s weird because the rep asked me to post it and then next minute that deal appears…hmmmmm….. I have an OzBargain alert for ThorFire to make sure I don’t mis great Q8 deals. I stole ya job lionheart lol i was looking at the deal Thorfire posted on Ozbargain and found the VG10s for $15.99 with free shipping if you have prime. I missed the Q8 special. Next time. Well im going to have to blame one of you for my newly aquired flashlight addiction. 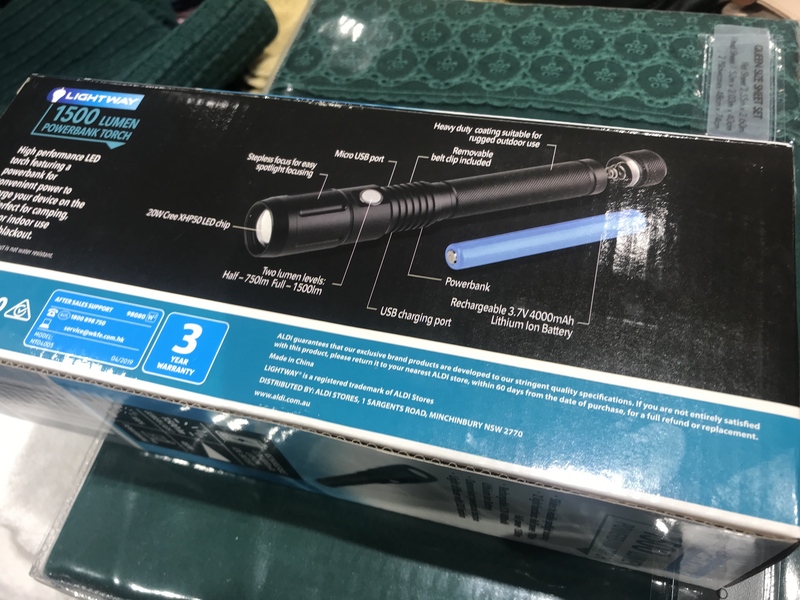 I found my way here through Ozbargain flashlight specials. I though you followed us here to correct our grammar and spelling lol. ThorFire had the VG10s on here for like $10 but it was an exclusive deal for BLF members you had to PM Thorfire on here. $15.99 is still heaps cheap its a great light. That’s totally fine by me!!! Keep it up! The two modes is average but it can be used as a phone charger. Pre spooled with mono line. 4000mAh battery. Not if its an 18650. I’d say the specs are Chinese. I was thinking its probably got a 26650 or two 18650s. I have seen a few lights from Aldi using XML2 and XPG2s never bought one i always wait till they are clearance and i miss out. I’m guessing 2× 18650; only needs 2.5-3A or so then, should be easy enough with something 6V. Not a bad price. Prime candidate for a dogfarts swap? Haha, it’s the LH351D 5000K 90CRI. The model number looks a bit like “dogfarts”; SPHWHTL3DA0GF4RTS6. It’s got the same die size, so it’d drop right in for a nicer beam. Also saw that Aldi torch tonight: XHP50 and a strangely looooong battery. Assuming it’s two 18650s in series wrapped up. So ~3.3A, nice. Omg it really does look like dogfarts!!! Isn’t that LED super hard to get a hold of? Be awesome in the Emisar lights, great tint and CRI. I guess I'm just not that sensory, the most I can do is smell dog farts....glad in a way really why would you wanna see them too!! !